According to UNICEF figures, in South Asia 36 children for every 100 who start primary education will not reach the final grade. This is the highest drop-out rate in the world. The primary factor for these dropouts is poverty and other socio-economic constraints. In order to drastically reduce the drop out rate, special attention and resources have to be given to these children who might be at risk of dropping out of school. Providing quality education, as well as the resources necessary to maintain it, is absolutely crucial. This is where Reaching Hand believes that we can play a small part in bringing about a big change. By providing quality school kits, we are not only working towards reducing school dropouts, but also encourage children to attend school prepared and regularly, as well as enjoy their educational experience. We also hope to target the large percentage of out-of-school children so that they too are encouraged to start attending their local schools. Thus, the school kits are a simple solution to a widespread problem. Currently, Reaching Hand works with more than 54 government schools, impacting over 13,000 students. What we have noticed in many of our partner schools is that a large percentage of students either do not have a school bag, or make do with something as crude as a plastic bag. The idea of giving out a school kit is not simply a goodwill gesture, but rather an opportunity to encourage children to learn - On one hand, it is an opportunity to equip needy children with school kits that they otherwise could never afford. But more importantly, the kits will help the students to be more organised, prepared and excited to learn, and in the process strengthen their overall educational experience. Our aim is to provide 5000 underprivileged children at our partner government schools with much needed school kits. Each school kit will contain all the necessary stationery supplies, learning resources and eating utensils that will ultimately enable and motivate each child to learn. 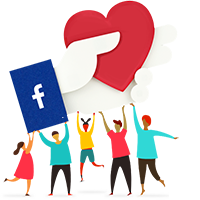 You can be a part of this initiative by contributing a small amount that will make a huge difference. Help educate a child today by sponsoring one school kit at just ? 500. Feel free to ask REACHING HAND for a new update on this Fundraiser. 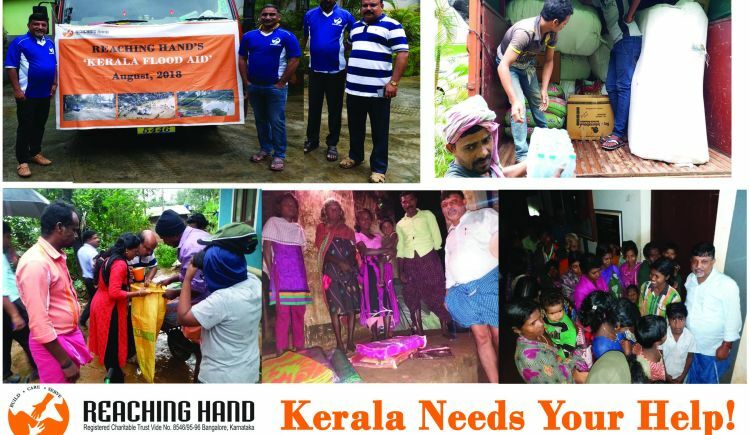 We would like to bring forth the efforts and contributions Reaching Hands has been able to provide so far as part of relief to the victims of the Flood Affected areas in Wayanad and Ernakulam Districts in Kerala and Kodagu District in Karnataka. Reaching Hand has been able to support over 2157 families in 45 villages in the flood struck areas of Kerala and Kodagu with immediate and rehabilitation materials from 17th August onward.
" Unfortunately the damage had been pretty much been done.."
Over a month since the floods devastated life and property on a huge scale in Kerala and Kodagu. As the residents inch to get back to stability Reaching Hand Team witnessed emotions over pouring as they narrate their plight. Reaching Hand Management team is on ground since 23rd Sept, 2018 to understand the need of the hour of the flood victims and to support them. Reaching Hand has supported over 2000 families and aim to double the count in the next few weeks. You can be part of this journey. Support us with time, efforts and donations. 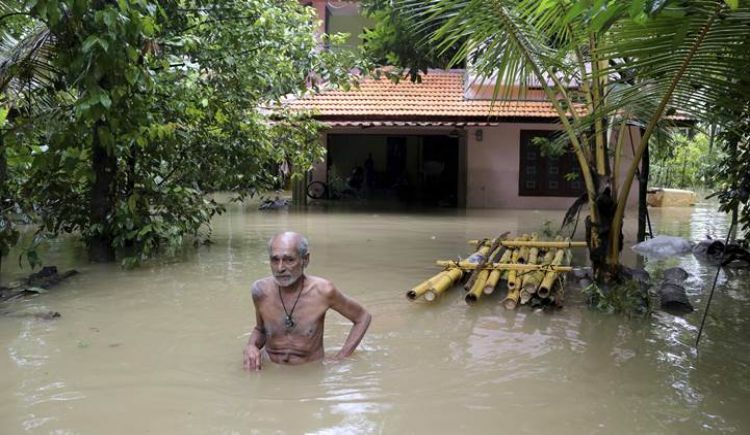 Kerala: Kerala has been witnessing one of the worst floods since 1924. Union Home Minister Rajnath Singh, who conducted a survey described the situation as something never witnessed by the state since independence. 13 out of 14 districts are affected, as the state has received 38% excess rainfall from June till date. Heavy rains drove authorities to open the shutters of 80 dams/reservoirs. Resultant flash floods and landslides have left more than 400 people dead and displaced more than 1000,000 people as per the latest reports Those forced from their homes are sheltered in 3724 plus relief camps across the state. Disaster Relief Agencies of Central and State Govt’s, Indian Army and NGOs are working round the clock to rescue people and provide relief materials. Karnataka: Kodagu is one of the districts in the southern state of Karnataka worst hit by the south-west monsoon rains. Located in the Western Ghats mountain ranges, the incessant rain has been causing landslides across the region, making rescue operations difficult. As incessant rains continue to cripple large parts of Karnataka, the state government has issued flood alerts for many districts. Most of these are in the coastal region. Madikeri is among the places worst hit by lashing rains in Kodagu district. 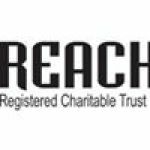 Reaching Hand has already undertaken the 1st phase of Emergency Relief in Wayanad district in the week: 12-23rd Aug’18. Based on the ground situation and assessment of relief interventions, we have requested the District Collector to allot us 2-3 villages, for us to cover 4000 families with Relief Assistance, to enable them to address their post relief camp needs as they begin moving back to their homes. For Kodagu, our relief intervention will be for 1000 families from 1-2 village communities, in close coordination with local authorities. Kerala Govt has put in place a system of updating all concerned with Relief materials needed in different districts (https://kerearescue.in). Reaching Hand is closely working with concerned authorities to ensure our Relief Intervention doesn’t duplicate other efforts but reaches those in dire need. A Team of Reaching Hand Volunteers is already mobilized and has completed the 1st phase of Immediate Relief, which is done in close coordination with District Collectorate of Wayanad. RH has made its trip to Kerala on August 17th and 23rd 2018 Wayanad as part of ' Kerala Flood Aid'. The 15 member team was able to cater to the immediate needs of 3000 families stranded at 40 camps in the various districts of Wayanad. The immediate relief items were contributed by various individuals and corporate. We moved to Phase 2 requirement where the Reaching Hand team along with the corporate partners will concentrate on providing Relief Kits for 5000 families. We are working in close coordination with the local administration to assess the need of the affected families and accordingly we have set up the relief kits. Your message will be directly emailed to REACHING HAND and you will receive his/her response on the email address entered below.